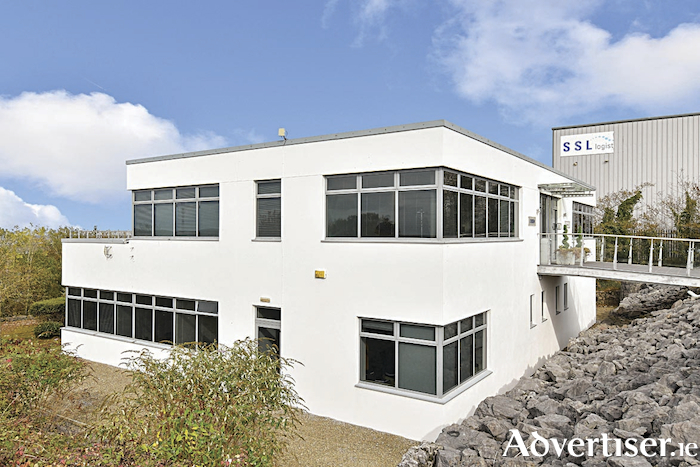 This property is located in Parkmore Business Park West, Parkmore, on the east side of Galway city approximately 6km from the city centre and 2km from the M6 motorway to Dublin, which connects with the M18 motorway to Shannon Airport and Limerick city. Other businesses in the immediate area include Medtronic AVE, Celestica, and Creganna Medical. Other business parks in close proximity include Parkmore Business Park East, Galway Technology Park, and Briarhill Business Park. Galway Racecourse is also nearby. This is a split level detached office unit on its own site with 30 parking spaces. Total floor area of 528sq m. Built circa 2002, it is of pre-cast concrete construction with a cladded double skin roof. The accommodation includes a lower ground floor area of 222sq m which has natural light from three sides. This floor is divided into individual offices, one large open plan office space, ladies' and gents' toilets, and store rooms. It has a suspended ceiling with air conditioning. The upper ground floor area is 306sq m and is divided into individual offices, open plan offices, large lobby, conference room, canteen, and disabled toilet. Access to the lower level is by concrete staircase. There is a large terrace to the rear of the upper ground floor with an area of 60sq m which boasts panoramic views of Lough Corrib and the Connemara mountains in the distance. The unit has a suspended ceiling with air conditioning. There is a precast concrete floor and there is carpet tiled flooring throughout. The wiring has Cat 5 capabilities and is supplied by wall socketing and service columns.